Central to the CSIS’ claims is the contention that rail cars spotted in satellite photos taken on April 12 of Pungang-ni Railyard, which serves the Yongbyon facility, are specially outfitted to transport nuclear flasks meant to handle radioactive material. 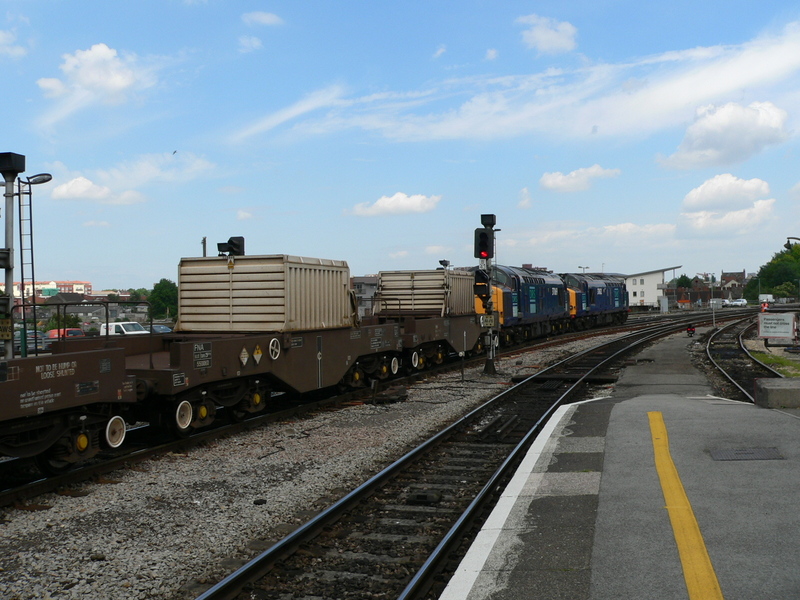 But this declaration is majorly flawed – footage shows that the cars hold five to six containers. Nuclear flask cars only carry one. A view of rail cars carrying steel coils near the isotope/tritium production facility on April 12, 2019. Photo: DigitalGlobe. The cars are actually more likely to contain steel coils. 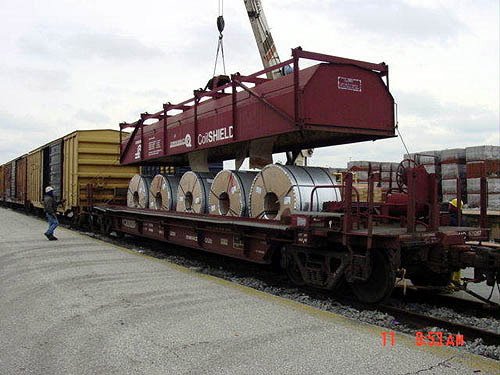 Steel coil cars commonly carry anywhere between four to eight coils per car and have distinctive steel covers placed on them during transport. It is most likely that the blue covers shown in the images published by CSIS show these exact covers next to cars that hold coils, not radioactive material. One of the five rail cars carrying steel coils. Photo: DigitalGlobe. CSIS also asserts that “similar rail cars” have been previously observed in the Pungang-ni Railyard and the rail yard servicing the Uranium Enrichment Plant and Isotope/Tritium Production Facility (IRT-DPRK). But they fail to provide photographic evidence of this and do not specify on what dates the cars were observed. A total failure to meet any kind of burden of proof. A number of other images are also included, most of which even by CSIS’ own admission do not show evidence of any enrichment activity such as exhaust plumes emerging from the various plants at the facility. Image of the IRT-DPRK reactor and the isotope production laboratory showing a crane in the middle of a road. Photo: DigitalGlobe. Two of CSIS’ images show cranes in or around the facility buildings. One near the IRT-DPRK Facility sits in the middle of the road, either being transported or totally immobile. CSIS admits that they have no idea why it is present near the IRT-DPRK reactor, although its large size indicates that it is meant for some kind of deconstruction as it would be used to lift large building segments instead of individual pieces of construction material. Another crane sits near the Spent Fuel Rod Storage Building, which is located between the 5MWe and Experimental Light Water (ELWR) reactors. CSIS similarly does not offer an explanation for its presence, although the small size of the crane suggests that it is most likely conducting repairs to the Spent Fuel Rod Storage Building. An idle, parked flatbed vehicle near the ELWR reactor and crane performing apparent repairs at the IRT-DPRK reactor. Photo: DigitalGlobe. All other details pointed out by CSIS in imagery show either civilian vehicles and flatbed trucks sitting idly around the facility or other routine activities that have been consistently observed for years. These activities include minor excavations and dredging operations for gravel and sand that do not appear to have any direct relation to operations at the Yongbyon facility. A quick examination of the article’s authors explains their incentive in misrepresenting the Yongbyon imagery. Joseph S. Bermudez Jr. has worked as a senior all-source analyst and senior manager for DigitalGlobe’s Analysis Center. As Disobedient Media has previously reported, DigitalGlobe is an American vendor of satellite imagery founded by a scientist who worked on the US military’s Star Wars ICBM defense program under President Ronald Reagan. DigitalGlobe began its existence in Oakland, CA and was seeded with money from Silicon Valley sources and corporations in North America, Europe and Japan. Headquartered in Westminster CO, DigitalGlobe works extensively with defense and intelligence programs. In 2016, it was revealed that DigitalGlobe was working with CIA chipmaker NVIDIA and Amazon Web Services to create an AI-run satellite surveillance network known as Spacenet. Victor Cha was previously a former Director for Asian Affairs in the White House’s National Security Council (NSC) and acted as President George W. Bush’s top advisor on North Korean affairs. It is no surprise to see a former NSC staffer involved in efforts to misleadingly undermine the Korean denuclearization process given National Security Advisor John Bolton’s notoriously hawkish stance on negotiations in the place of a military solution. The same day that CSIS ran its report, Reuters immediately picked it up, expanding on CSIS’ article to contend that North Korea had begun reprocessing activity at the Yongbyon facility while not displaying any of the photos published by CSIS. In his tweet of the article, author David Brunnstrom made the interesting decision to tag John Bolton. An examination of past articles from Brunnstrom, who was previously a NATO and EU correspondent in Brussels, shows that he may be acting as a media asset leaking articles strategically on behalf of John Bolton. Brunnstrom has run a reports that attempt to shift responsibility for the stagnation of talks onto Secretary of State Mike Pompeo and President Donald Trump despite the fact that it is John Bolton who is widely credited as the major force opposing the denuclearization talks. He was also the recipient of the copy of a leaked document from the Hanoi Summit authored by John Bolton which is credited with angering Kim Jong Un and scuttling the event. Brunnstrom has also written for The Independent pushing unverified claims from the United Nations that North Korea was working to ensure their nuclear and ballistic missile capabilities “could not be destroyed by military strikes.” The United Nations have, much like a number of American think tanks, misleadingly interpreted satellite images as a means of justifying sanctions which have previously proved to be a sticking point between North Korean and American negotiating teams. The Independent itself has recently lashed out at Donald Trump after he amplified a tweet from this author stating that the United Kingdom’s involvement in Russiagate had been partially incentivized by their desire to use the United States’ military hard power to counter Russian influence around the world. The idea that a seasoned analyst for DigitalGlobe could seriously mistake rail cars carrying steel coils for nuclear flasks is ludicrous and indicates that factions who are hoping for an aggressive approach towards North Korea are running out of options to make their case for a tough denuclearization strategy. Individuals such as John Bolton, who is notorious for his promotion of the “Libya solution” for North Korea are apparently going all out to have friendly journalists amplify the propaganda that has been consistently emanating from think tanks since the Hanoi Summit ended without a deal being reached. Instead of falling for sensationalism, parties must stay the course and continue to give talks a chance. If the media is looking for actual evidence of sanctions violations to report on, there is plenty of evidence readily available to them should they wish to look for it. The Trump administration needs to get over this intellectual masturbation about North Korea. Yeongbyon no long plays a central role in North Korea’s nuclear weapons program. Isotopes detected from DPRK’s underground nuclear testing prove conclusively that North Korean nukes do not use Plutonium. They use Uranium235 HEU harvested from centrifuges. Yeongbyon is barely used these days and there is no harvesting of Plutonium from spent fuel. DPRK have lost all interest in Plutonium. One wonders why the US military would not be considered the real expert on photo interpretation, and not a private think tank. CSIS seems to want to sabotage Trump’s work.